Peachy Pork and Beef Tacos for the win! Three reasons to serve these festive tacos at every tailgate party. Easy to make. The beef, pork chorizo and peach mixture comes together fast and easy at home. Minimal chopping, as only those nutrient-rich peaches need to be chopped. So easy. Then all ingredients are cooked stove top in your favorite big skillet. No fuss. Easy to transport – and keep food safe. 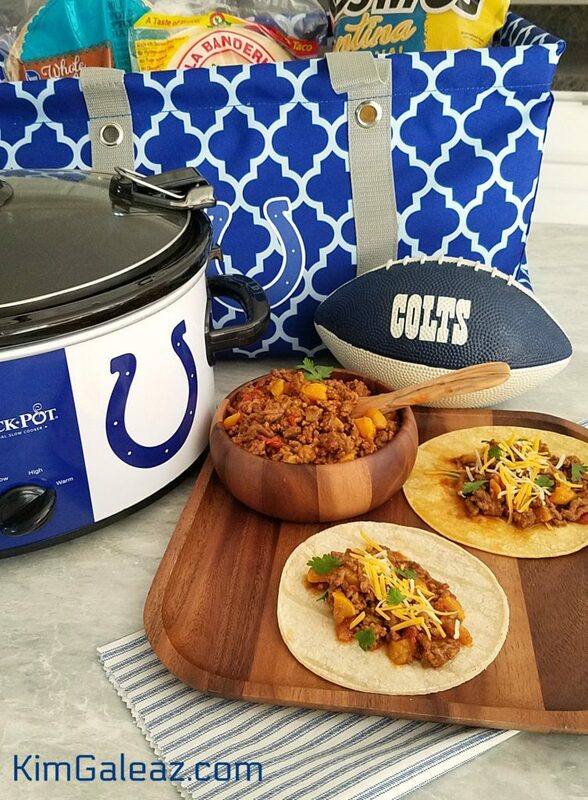 Once the mixture is made at home, just plop in your Colts crock pot and keep them warm for maximum food safety. Filled with good nutrition for everyone. Power protein in that lean ground beef and phytonutrients for heart health in the peaches, chilies and diced tomatoes. Even some decadent pork chorizo for the “happy eating” part of good nutrition. Serve with whole wheat or corn tortillas for your grain serving and sprinkle with shredded cheese. 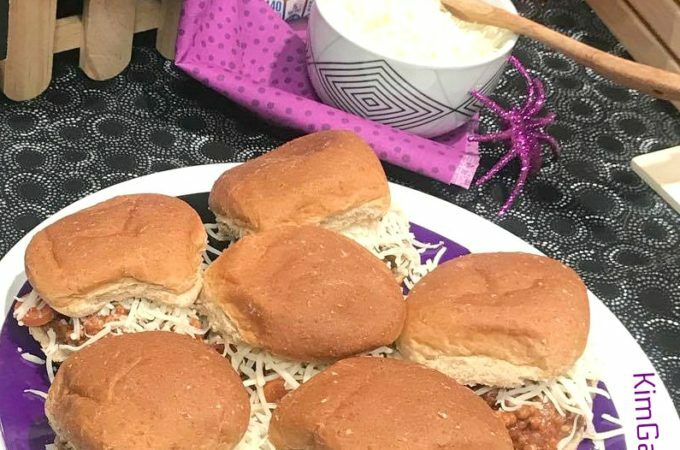 This dietitian says “touchdown!” Because all five nutrient-rich food groups are represented, and who wouldn’t like to enjoy eating more fruits in a zesty, tasty taco?! Easy skillet dish filled with nutrition. 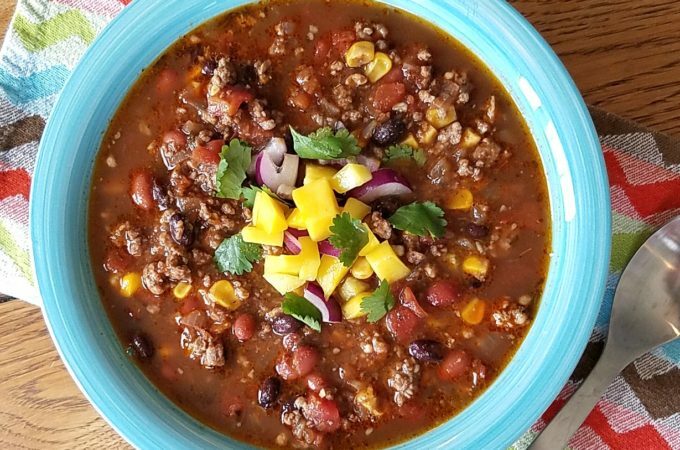 Perfect for fast weeknight meals or tailgate parties. Heat oil in a large skillet over medium heat. Add ground beef and pork chorizo and heat until thoroughly cooked. Stir in tomatoes, green chilies, diced peaches, cumin, garlic powder, chili powder and coriander. Add hot pepper sauce if desired. Cook, stirring frequently, until mixture is completely hot, about 5-7 minutes. Keep hot while serving. Serve with toppings and corn/flour tortillas and tortilla chips. Refrigerate leftovers in a tightly covered container.